This is what I created using Beate's Weekend Sketch Challenge. 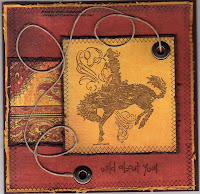 The paper is Chocolate Chip, Marigold Morning (SU retired) and Daisy D's Designer Paper - Gypsy... For SU products I used the Bronco, All In a Row and Wild About You stamp set. 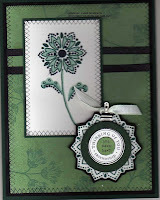 The Ink I used was chocolate chip and I used the large Pewter Brads with hemp and glue dots. Thanks for looking and have a great day! 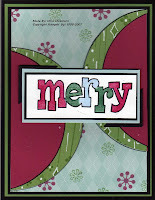 On my last card, I had originally made the circles too large and had to trim them down. This left me with scraps of lunar shapes. When I saw them I had this idea! Always use your unique shaped scraps! :) The colors I used were from SU - Pomegranite, Wild Wasabi, Soft Sky DP, basic Black and Whisper White. I also used to white gel pen to highlight areas on the paper. One thing I thought - but had the card already well glued down was to add brads going down the sides of the circles - for a little extra "something." This card uses the small clips made by SU. I just LOVE them. I used the TRUE FRIEND stamp set, along with the Circle of Friendship and the All In a Row. I rarely use the Handsome Hunter, so thought it would be fun to play with - I also sprayed Glimmer Mist on the card to add some shimmer. Once I stamped the image and sprayed the Glimmer Mists - the ink ran a bit so I went back over it with a marker to give the image a "crisper" look. Well- with my schedule lately, it seems I have about one or two days a week to stamp. 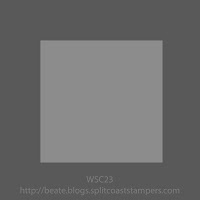 This week I worked on Beate's Weekend Sketch Challenge and this is what I came up with... http://beate.blogs.splitcoaststampers.com/category/weekend-sketch-challenge/. 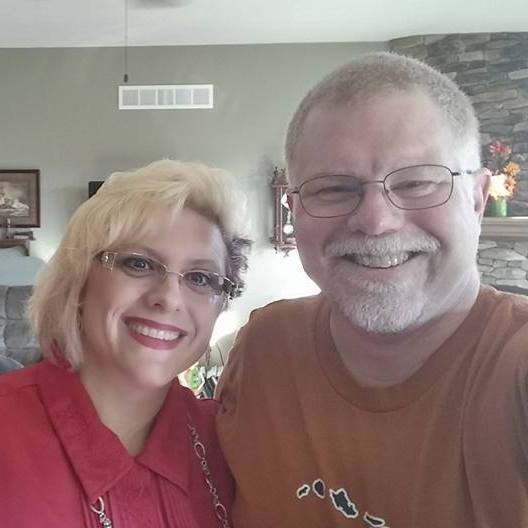 I purchased a product called Glimmer Mists that adds a colored shimmer to your artwork. I also used the Crop-O-Dile and added the dimension to the small circles on the oval punches. I got a little over zealous with the Glimmer Mist and had to highlight some areas with the white gel pen. 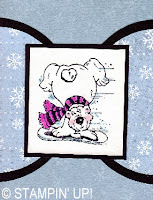 The Faux Stitching uses the All in a Row stamp set. 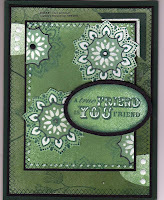 This weekend, my friend Danita and I did some stamping. It was lots of fun. 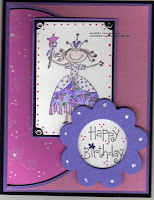 Here is another card made with Beate's Challenge. This one used a stamp I do not know who made. I borrowed it from Danita. I just LOVE this image! I crumped the paper and then sponged it with bordering blue and lightly with Navy. I also sponged the Blue Bayou ribbon with Night of navy to make it a bit darker. 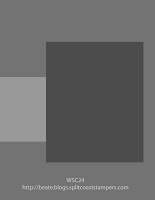 It worked out prefectly and matched the Bordering Blue better. The butterflies and the watch - I cut out and used dimensionals to give the card a little "dimension." 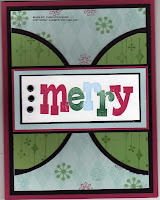 This was a color challenge too from Splitcoast Stampers. The colors I used are Regal Rose, Blush Blossom, Bordering Blue and Night of Navy. 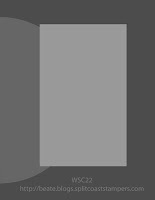 I also used the French Flair BG, Canvas BG on the cardstock.